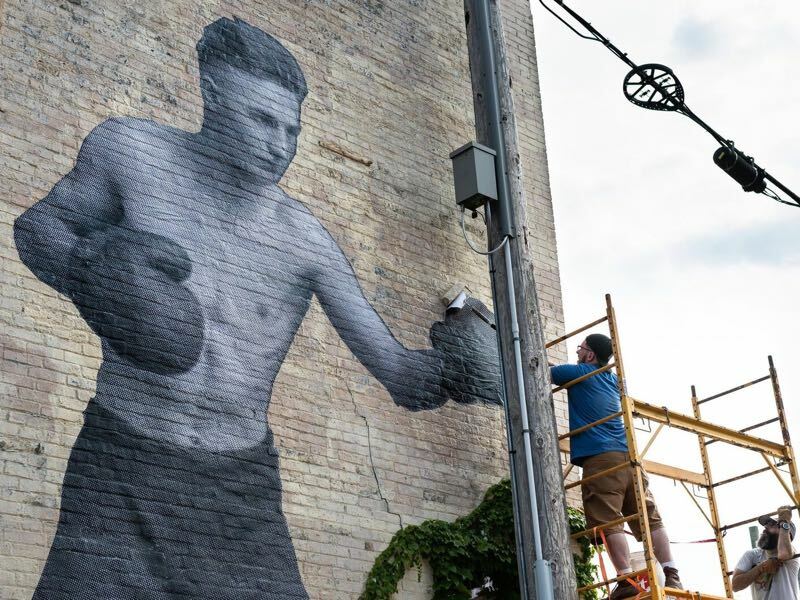 Published Aug. 16, 2018 at 4:02 p.m.
As of this week, a 23-foot-tall image of Milwaukee boxer Emil Kayer adorns the side of the RedLine Gallery building, 1422 Vel R. Phillips Ave.
Kayer was a Polish immigrant from Polonia, a neighborhood located on Milwaukee's South Side, and a member of the Kosciusko Park Boxing Club which is still active today under the name Ace Boxing Club. The image, which was originally taken in 1920, is from the Roman Kwasniewski collection from the UWM Library Digital Archives and is the first collaboration between Marc Tasman, senior lecturer at the University of Wisconsin-Milwaukee in the Department of Journalism, Advertising and Media Studies; photographer and artist Jake Hill; and Clayton Haggarty, a RedLine artist and UWM grad with a degree in painting. The image of the boxer is intended to speak beyond the sport and also serve as a symbol of empathy. "In boxing, a competitor actually scores points by the damage that they inflict upon the body of their opponent. So when we saw this photo plate of Emil Kayer in two poses next to each other it almost seemed as if he was two people, fighting each other. We thought, whoa, what if a boxer inflicted that damage on their own body, or at least could fully understand the impact of each blow. That's empathy, right?" says Tasman. "So the boxer on the side of the building is a symbol of empathy that we as artists would like to see come back to civic discourse and human consciousness." The collaborators used wheat paste – which is similar to wallpaper paste – to adhere the image to the north side of the building. "It's just paper affixed to brick with essentially heated vegan pancake batter. But not gluten-free," says Tasman. The image should stay intact for a few years, but it's difficult to predict how it will weather because of, well, weather. "I'm guessing it should last one year in pretty good shape, but after two or three winters it might get ragged around the edges, then start to sheer off," says Tasman. The installation began as part of the Look Here! 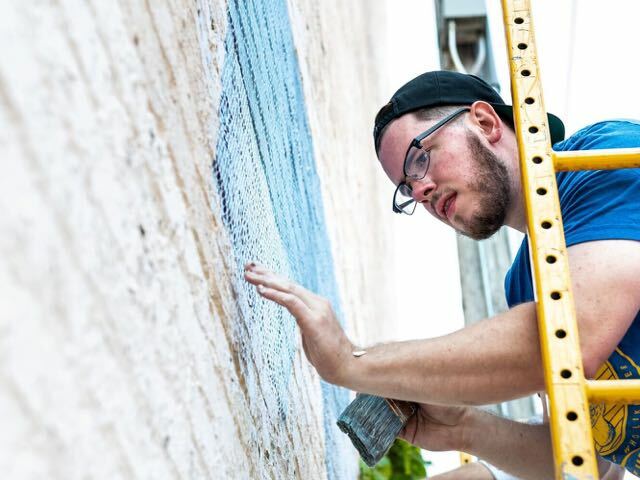 project, an initiative at the UWM Libraries to raise awareness of its archival offerings by having local artists find inspiration through the various digital and not-yet-digital collections. In the future, Tasman says they are considering creating more murals and other commissioned projects. They will soon release a RedLine T-Shirt featuring the boxer. "I think the best thing that public art can do is awaken the imagination of the public, that means we, the people, to become the thriving culture that we've always wanted to be," says Tasman.